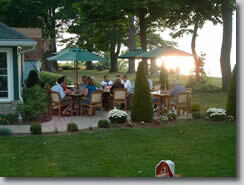 The Lakehouse Inn & Winery in Geneva-on-the-Lake, Ohio is the subject of our second interview with innkeepers who have used Living Social or another of the social commerce sites available. The opportunity for innkeepers to take advantage of these sites to pump up the volume of their business in the off seasons have become more and more prevalent. Is it here to stay? That will depend on the public and the experiences they receive. Let’s hear what innkeeper Andrea Bushweiller has to say about her experience and her guest’s comments on their experience. Q What was your motivation for using Living Social? I first heard about Living Social at the PAII conference in January and after speaking with a representative from the company decided it would be a good way to generate business mid-week during the winter months when business is usually very slow. I also thought it would be a great way to reach consumers that did not know about our facility and the extra business would keep my staff busy. Q What did your package include? The package includes 2 nights lodging in a traditional B&B room or cottage (Sunday-Thursday), a full breakfast each morning, 2 wine tasting trays, a bottle of Lakehouse Inn wine and 2 souvenir wine glasses. Q What kind of feedback have you gotten from the participating guests? Overall, the guest comments were positive-many of them had never been to our area or our Inn before and many said they would return again. Some people were disappointed that there was not a lot to do in the area (it was the off season) and many complained about the weather (nothing I could do about that!). Also, many people did not read the restrictions before they purchased it so we had to spend time explaining to guests that it was only valid in the winter and why they could not use it during the summer. Q Would you do it again? Q What advice would you want to pass on to innkeepers who are considering putting a package on a social commerce site? 1.) Be prepared for your phone to ring like crazy the first 48 hours. Even though we were told to be prepared we were not ready for the 100+ phone calls we received each of those days. 2.) We had to extend the dates of our offer. All of the dates for the last month (May) booked up in the first few weeks. We then had numerous guests call us in mid-April/May wanting to make reservations and we no longer had dates available so we had to extend the offer for the end of October-mid-December. 3.) If you are going to offer a deal from Living social or a similar site think carefully before you choose the dates that you want to the package to be valid for and only offer dates that would normally be empty. For more information on the subject PAII CEO Jay Karen has recorded a video entitled “Social Buying: Craze or Just Crazy?,” which is one of PAII’s webinars available to members. He has teamed up with innkeepers like Andrea who have used social buying. They discuss everything from the successes to the challenges. Worth looking into? Any information available to help innkeepers attain a higher degree of marketing success is definitely worth looking into. The video is available for purchase or free depending on your membership level. Also check out the PAII Forum for the occasional thread on innkeeper’s experiences and questions concerning social commerce. One of the best and most informative blogs on social buying was written by The B&B Team affiliate and braniac Scott Bushnell. If you haven’t read this already, read it and read it again! What’s all this Stuff about Living Social and Groupon? Among other information Scott explains the financial process innkeepers should consider to help them understand the variable costs involved when creating a package. This information is most valuable. We believe that before you proceed with social buying as a provider the more research and preparation you do, the more successful you will be. This entry was posted on Wednesday, June 29th, 2011 at 7:35 pm	and is filed under Financials, Innkeeping Business, Market Trends, Social Media. You can follow any responses to this entry through the RSS 2.0 feed. Both comments and pings are currently closed.